Work With MeWork with me Hanna Boëthius as a coach or have me speak at your conference or event. Do you remember when you were little and your mom would make you these amazing, perfectly fried pancakes? Well, I do. And I’ve been missing them a little since I cut out grains from my diet, a good few years ago now. Throughout the years, I’ve been trying one low carb pancake recipe after the other, but they never quite get to where I would like them. They’re either too soggy, too thick (I much prefer crepes to american style pancakes! ), taste too much like nuts, don’t contain enough fat, or, frankly, are too complicated to make with ingredients that you have to really go on a hunt for. 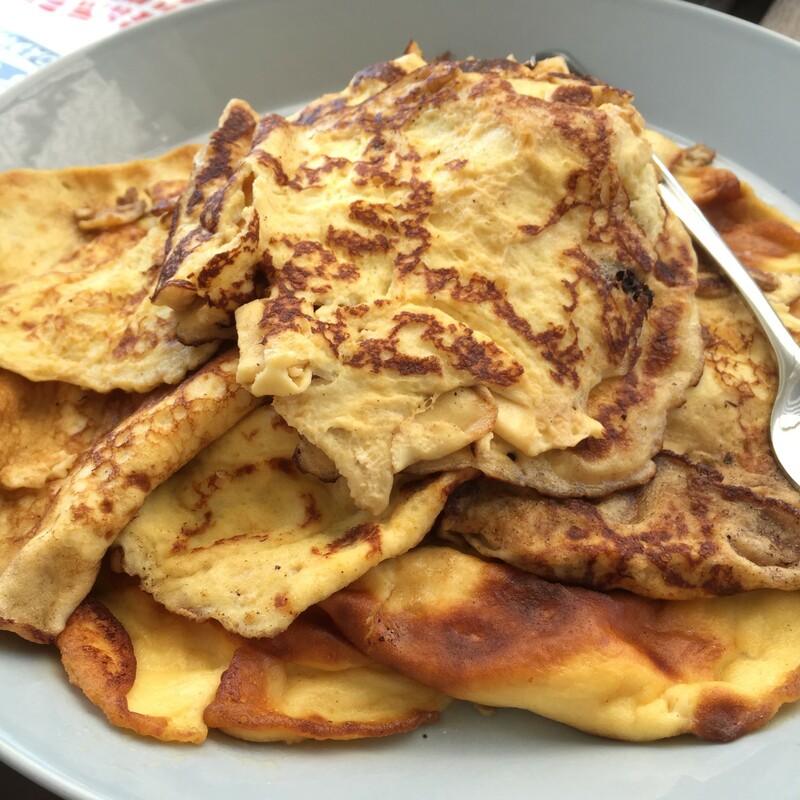 Call me the Goldilocks of Pancakes if you will, but finding an easy, yummy, healthy, low carb pancake recipe has not been easy. I might as well have gone out for that hunt of those ingredients no human has in their pantry ever. I’ve recently given up a bit on searching for The Pancake Recipe. Too much milk products isn’t an option, neither are fake ingredients. Or combinations of ingredients that give them a funky flavor. No, thanks! I’ve quite frankly completely stumbled upon what might just be The Complete Pancake Lovers Awesome Recipe For Low Carb High Fat Pancakes! I was first alerted to this recipe through a fantastic Facebook group I’m in, and thought it sounded a little weird, to be honest. “Egg and cream cheese, that’s it?! They’ll never keep together and the’ll taste like, well eggs and cream cheese. Perhaps sometime when I have n o t h i n g else at home.” my mind started blabbering. That day was the other day (although we had tons of other yummy food at home). Turns out, they hold together just fine, almost better than “normal” pancakes. And the taste… I bet you anything no one would realize they’re not “normal” pancakes if I served them these. They taste exactly like I remember pancakes tasting! This recipe is from the wonderful blog I Breathe I’m Hungry, where you can find the recipe in all its glory and originality. Pour some batter into a hot pan with some melted butter. Cook for 2 minutes until golden, flip and cook 1 minute on the other side. 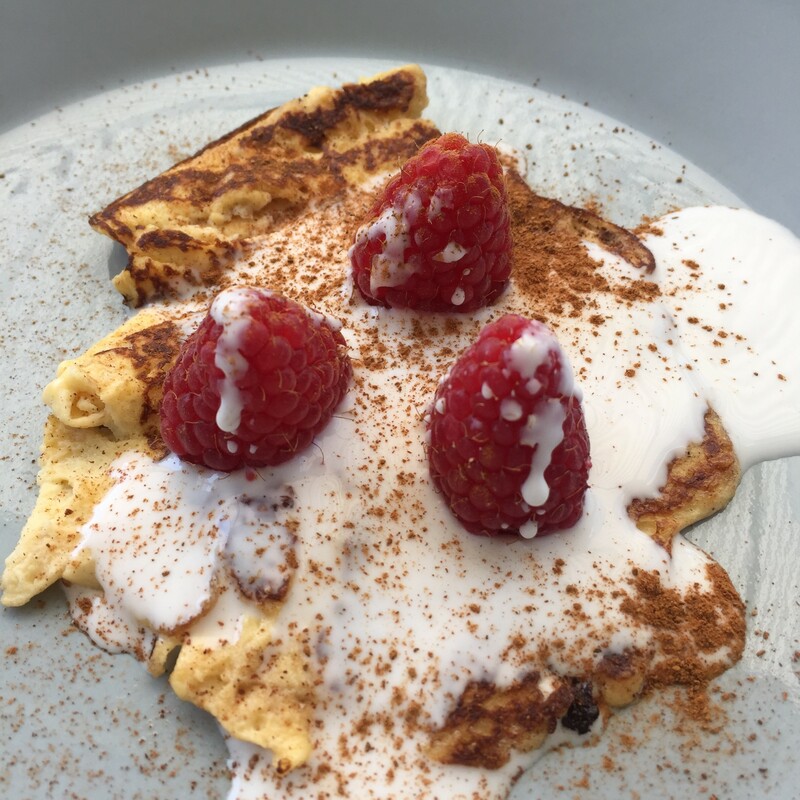 Serve with some fresh berries, cinnamon, sweetener if you want, lemon, almond butter, butter, bacon… The world’s your oyster and the sky’s the limit! Hope they can become a staple in your food routine, it’s always nice with new inspiration. Do you have a favorite pancake recipe you want to share with me? Comment below! Have you ever tried seed crackers? All you wanted was a little crunch in your life, but all you got was disappointment. Were they a little… papery? Or were they full of chemical stuff, or stuff that you can’t/don’t want to eat? I’m making you a very happy bunny today. Almost everyone who has tried these seed crackers has asked for the recipe. I’ve even ended up selling quite a lot of it! So today I’m going to be super nice and share it with you so that you can make it yourself! ! It’s safe to say that this will be the only crack(er) recipe you’ll ever need. And, what’s fantastically awesome about these is that they are completely allergen free! No grains, no gluten, no dairy, no egg, no soy, no funky chemical stuff. Well, unless you’re allergic to seeds (sesame? ), or crunchy seed crackers! The recipe is actually super simple, and can be tweaked exactly to your liking. Mix all the ingredients carefully. I like to mix all the dry ones first, then add the olive oil and mix again. Lastly, I add the water. Mix! Let it rest for 10 minutes. Put the oven on 150 degrees celsius (300 fahrenheit). Bake half of the mix out between two sheets of parchment paper. Use a rolling pin to flatten it out. The mix gives you two baking sheets, depending on the size of your oven, of course. Remove the upper layer of parchment paper, and cut the dough into cracker sized pieces before putting it in the oven. Let it dry in the oven for 55 minutes each. Et viola! Enjoy with some butter and your favourite sandwich topping. These are super filling and contain so much good stuff, like fibre, Vitamin B, Vitamin E, Calcium, Iron, Copper, Magnesium, Manganese and Zinc. The only problem you’re going to have is to stop eating these…! You can add all kinds of herbs and spices to it to make it your own and to add variation. Here are some ideas: chili flakes, Italian/French herb mixes, sea salt, pepper, paprika spice, taco spice mix (make sure it’s a clean one), fresh garlic, rosemary, oregano or basil, or even cinnamon or cardamom to put a sweeter spin on it. I’ve also played around with adding and removing different seeds to the mix. I’ve added chia seeds and whole psyllium seeds, for example. This gives it a completely different taste and texture. Please try this out, it’s definitely worth the longer time it takes to make it than just picking any old crap up from the store. And don’t forget to leave your comment below of what you think of it! Going grain free = going bread free. In the very most cases, at least. The “bread” you do eat won’t be the factory produced, refined stuff you find at the super market. Bread is usually one of the things I hear most often from my clients that they miss when they are getting healthier. Which nowadays really surprises me, actually, although it didn’t use to… I was just as much of a bread addict as I’m sure you are, or have been, too. But I’m very proud of you that you’re willing to make this change for yourself; to go at least gluten-, if not grain free! So, you know those mornings (or lunches, or evenings), where you just wish there was a simple, yet healthy, thing you could throw together and have fresh out of the oven? These wonderfully nutritious and yummy paleo scones you can whip together in under 5 minutes. And they’re done in 10 in the oven. You can also put some seeds on top of the scones, making it more into a type of bun than scones. Variations are endless! Enjoy with butter, cheese (if you can handle it), vegetables, ham, or unsweetened jam, or almond butter. I’ve based this recipe on the fantastic Annika Sjöö’s original recipe. She’s a truly inspiring swede who is fully into eating Paleo and training CrossFit, and won Swedish “Let’s Dance” (“Dancing with the Stars”) a couple of years ago. If your Swedish is any good, check out her inspirational blog here! Let me know what you think of this recipe! Do you have another favorite (grain-free) bread recipe to share with me? Post it in the comments! I know just how busy you are today. So today’s post will be very short and to the point. A few people have asked me about the recipe for the Saffron Coconut Macaroons that I shared in my Diabetes Advent Calendar. And because I’m feeling the festive spirits (no, I don’t mean the rum), I want to share it with you here on the blog today! Put the oven on 175 degrees. Melt the butter with the saffron. Whisk together the egg and sweetener of your choice. Add all the other ingredients to the mix. Let the mix rest for a few minutes. 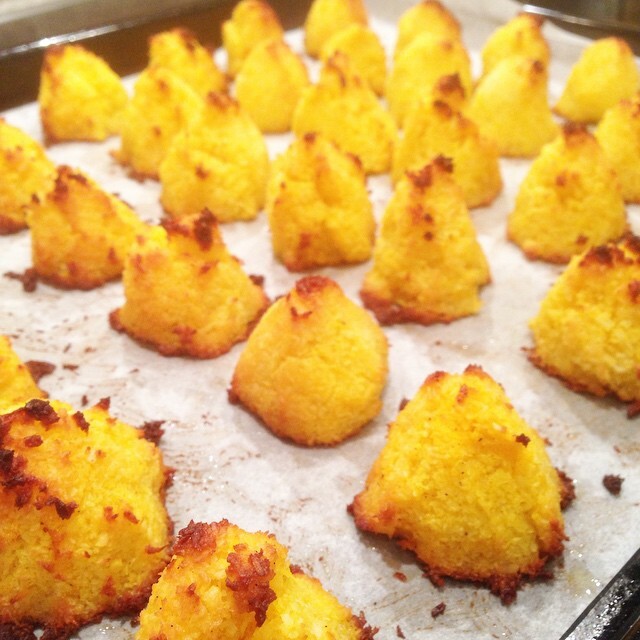 Make “peaks” on a baking sheet and bake in the oven for 10-15 minutes, until the tops are golden brown. Each peak has 4 grams of carbohydrate. These yummy treats are gluten-, grain-, treenut-, soy- and (almost) sugar free, so they suit most people. Let me know how yours turned out in the comments below! Recently, there’s been one burning question I’ve gotten from you. Well, I’m not sure I can help you with the 3-second rule, but I do have tons of yummy and (relatively) quick breakfast options in mind. The key, as always, to keeping your healthy routine going, is to P R E P A R E. Prepare and be prepared for those 3 second breakfasts. All these 11 breakfast recipes are gluten- grain-, soy- and yeast free. I’ve included the carb count for my fellow diabetic out there, so you know how much insulin to take. Whisk in a pot on low heat until there is a porridge like consistency. Halve an avocado and put one half per serving in an oven form. Crack an egg into where the pit was, and bake it in the oven for ca 10 minutes at 175 degrees (or until the egg is cooked). Put all ingredients in a blender, blend, drink, feel amazing. Take sandwich ham, roll a piece of cheese and some vegetable (cucumber, bell pepper, avocado) in it to make a roll. Slice up an apple. Spread almond butter on it. Enjoy. You can find the muesli recipe in my recipe book you can sign up for below. Carbs: Yoghurt 5 grams, muesli depending on what you put in it. Mix this in a bowl, and let it stand in the fridge over night. Ready for breakfast the day after! Carbs: 20 grams for the whole thing, but it’s enough for about 3 or 4 servings, at least, making it 5 grams of carbohydrate per serving. Click here to get my Energyball recipe! Carbs: 55 grams for all of them, so if you make it into 10 balls, it’s 5,5 grams of carbs each. Carbs: eggs only have trace carbs, but 13 g of protein each. Remember that if you find you need to bolus for gluconeogenesis. Click here to get the recipe for the awesomest GrainBrainCh bread, gluten- and grain free, of course! Carbs: 35 grams for the whole thing. Depending on thickness, about 2 grams per slice. If you’re anyways going to chug some coffee in the morning, why not make it a Bullet Proof Coffee? And, it’s really simple: you add coconut oil and butter to your coffee. Stir or make it frothy in a blender, however you like it, you’ll be full. I guarantee it. Carbs: Zero, or extremely close to it. I hope this helps inspire you a little for the highly coordinated morning rumble. Did I miss anything on my list? Is there a breakfast food you’re wondering about? Let me know in the comments below! Sign up to get my newsletter!